Remember the day your new swimming pool was finally finished? You couldn’t wait to dive in. 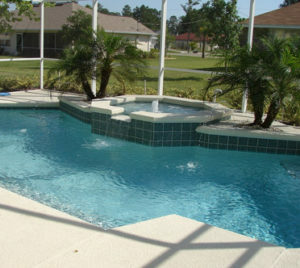 But now that it’s been around for more than just a few laps, is your pool in need of some serious sprucing and repair? Here are some practical pool remodeling ideas that are sure to float your floatie. 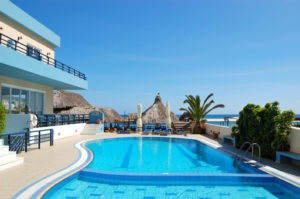 Pool deck resurfacing is like an automatic facelift for your pool area. It doesn’t have to cost a lot to add a new look (and feel) to your deck. Failure to keep up with the repairs and resurfacing can be expensive, however. 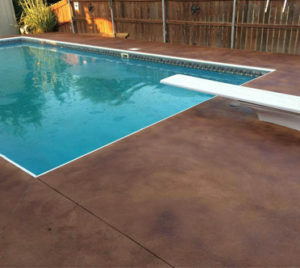 The most common types of pool deck surfaces include concrete, brick, tile, wood, pavers and stone. All need a good dose of TLC every now and then to keep them looking great and functioning well. The feel of rough, crumbling and cracked concrete under your feet is obnoxious and painful. Did you know that damaged concrete can lead to problems with your pool? Unlike a patio concrete surface, a concrete pool deck has to stand up to water exposure and the presence of pool chemicals that can be harsh. Concrete also needs to be a protective surface for bare feet and should be not be slippery. Concrete cracks are common in pool decks that have been in for a while. Not only are they painful to stump your toes on, they are a tripping hazard as well. Plus, when seeping water gets into them, it may collect behind your pool walls which can result in a leak. Water collections in hollow spaces can also cause shifting in the soil that may damage the entire structure of your pool. The price of just finding the source of the problem can be astronomical, not to mention the high cost of the repairs, especially if done on an emergency basis. Conducting regular maintenance and giving your concrete deck a resurfacing revamp is undoubtedly the way to go. You will enjoy the aesthetics and at the same time, be avoiding future problems and inevitable expenses. Sometimes all concrete needs is a good washing and staining to look its best. You can simply have the original stain reapplied or opt for a brand new appeal. The range of colors available is unbelievably extensive stain or you can even create your own custom blend. Some pool owners do the staining themselves but once they get it started, often find they have gotten into more than they anticipated. It is best to let the experts handle your concrete staining needs so the surface below is smooth and clean and the finished product is uniform and professional looking. 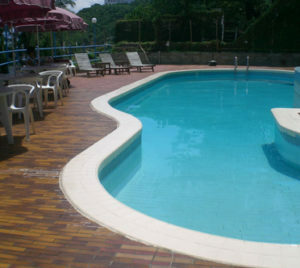 Pool pavers are popular around a pool area. They can be used to encase the pool, for a walkway, stairway or decking surface, or to add a decorative touch to the landscaping. A number of materials can be used to achieve the desired affect and purpose. The practice of interlocking the pavers, usually with concrete, clay, or brick type pavers, is called segmental paving. Stone paving is another technique which involves materials that don’t lock together. Bluestone, granite, sandstone, limestone, and basalt are commonly used for this method. If you already have pavers in your pool area, you will want to keep them in good repair. Failing to keep them properly maintained is unsafe an unwise. Pavers are typically less expensive to repair because the individual paving pieces can be replaced rather than having to do the entire surface. In the event you don’t have pool pavers, they can be added on for a brand new look of elegance and beauty. 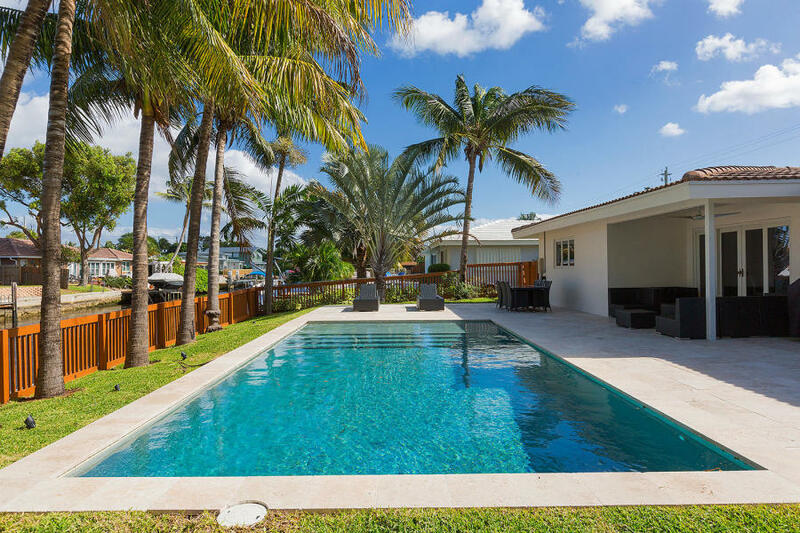 They also serve purposes such as providing solid and safe footing, efficient encompassing of the pool itself, or even keeping the landscaping ground from eroding into the pool. Pool pavers are an affordable option because you can choose the paving material and size of area that best fits your budget. Wood decking has been a favorite choice for pool owners for decades. 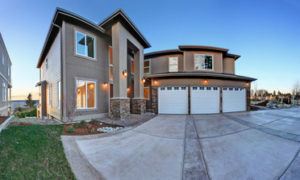 It is an economical way to add function and fashion to the surrounding area. There are a myriad of types of woods which can be used to achieve most any type of mood or theme. Not only is wood used to create a decking surface but can be used as steps or stairs or can encase and contain landscaping. You can even add wood benches for added appeal and extra seating. 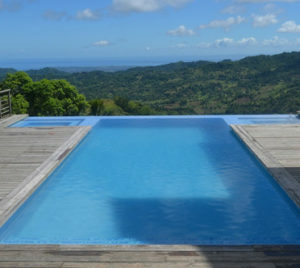 The kinds of wood that are most often used around pools are cedar, redwood, pine, teak, and mahogany. Each has its own set of benefits. Pine is less expensive and tends to keep cool better than others. Mahogany has a rich and elegant look. Cedar keeps pool pests at bay. Modified wood is also available. Just the way you arrange the wood can set the theme for your pool area. The wood can be laid in various patterns and directions to create a contemporary, rustic, or relaxed setting. If you already have wood in your area, you will want to keep it up. Replacing pieces of damaged wood will help prevent splintering and rotting. You may also want to stain and seal it to prevent weathering from the sun, rain, and snow. If you don’t have any woodworking yet, it’s a great and affordable way to remodel. You can do one wood project at a time, like add a seating area or table, and then later build a wood deck over a dull, heat-retaining cement one you chose originally. Or, you can go all out and transform your pool area all at once. Wood for pool remodeling is an excellent and affordable, very versatile choice. It allows for creativity on a budget that is large or small and tends to make drastic and dramatic positive changes to both the look and the function of the area. Stone in your pool area sets a solid foundation and adds eye appeal too. It can be used around the pool as coping, as the floor deck, around landscaping, and even to provide fashionable steps where the ground slopes. Some favored for natural stone picks are sandstone, limestone, granite, slate, bluestone, and coral stone. You can choose a stone to reflect the mood you would like to set in the pool area. You can also determine the function you want to achieve with it. Granite has a modern look and is long-lasting as it is the hardest of stones. Sandstone wears well and offset a neutral tone as a backdrop to show off the actually pool rather than the surrounding area. Stone requires tending when it is chipped or loose so as not to cause an accident or destruction to the pool foundation. If you don’t already have stone, it’s a fabulous way to remodel and can be done fairly inexpensively. Stone adds a great look and a longer life to your pool and pool area and usually with minimal repairing needed. Travertine is a variation of limestone that is universally beloved for use around the pool. In -nature, it can be found by mineral and hot springs, only reinforcing the fact it’s a great poolside partner. Commonly used for pool deck flooring, travertine may have a concentric or fibrous appearance and comes in cream, tan, white, and rust-like color choices. Luxurious pools often have travertine but it is also in basic pool areas. It is a popular pick by professional pool builders because it is slip-free, doesn’t retain heat and it is quite versatile and practical. There are three main types - polished, tumbled, and honed. Tumbled is heavily textured and porous and very suitable for a rustic and weathered tone. Polished is smooth, sleek, and shiny for a more contemporary look. Honed is matte and smooth and is great for artsy appeal. Coping in a pool is what is used for capping the shell of the pool wall. Pre-cast concrete, poured concrete, natural stone, and tile are often used for this purpose as are pavers, stones, and flagstone. It is common for pool owners to go with the most inexpensive coping initially and then to upgrade later on. If this was your plan, you may want to get started. When cheaper coping begins to wear, a world of issues can surface. The containment of your water can actually give way, flooding your yard and even your home. The cost to repair such a disaster is incredibly expensive. Your pool area will look like a brand new pool has been put by simply changing up the coping. For those who already have coping they are happy with, proper repair and maintenance is imperative. The cost of pool coping varies greatly upon the materials chosen and the area to be covered. It is extremely important to have a professional install or repair the coping as it requires precision and skill. Pool tile seems to add just the right touch in and around a pool. It is very versatile and can be used as coping or within the actual body of the pool. It can also accent or provide deck flooring and waterlines, raise the wall of a spa, or can create a breathtaking point of focus. There are many options when it comes to pool tile. The five main types of tile includes glass, mosaic, brick, stone, and porcelain. The vast selection of colors and color combinations offer pool owners all they need to create the exact decorating scheme they desire. When tiles ages, some may crack. Others crack or chip due to extreme abuse like a heavy object being dropped on them. Even one cracked or chip tile can look unsightly and can cause safety risks or pool problems. A professional can repair tiles in the specific area needed for a minimum fee. If tile is not something your pool area already has and you would like to use it in your remodeling, you’ll be delighted (and perhaps a bit overwhelmed) at all the possibilities that await you. Why not get creative with your concrete? Why settle for a bland, dirty-looking finish when it can sparkle? Diamond Brite is a finish for a pool that is exposed aggregate, a blend of quartz, modified polymer cement, and fade-less color quarts. 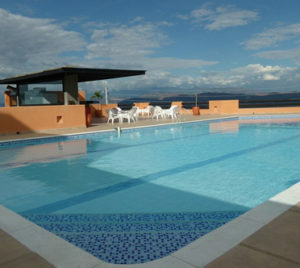 The object of the finish is to add lustre, comfort and durability to the pool. Diamond Brite is used as a plastering agent inside the actual surface of the pool. It can be chosen at the time of construction and may need a little maintaining now and then. It is vital to repair it as needed whether the damage is due to human error, like dropping something onto it, or Mother Nature (shifting of the ground, etc.). 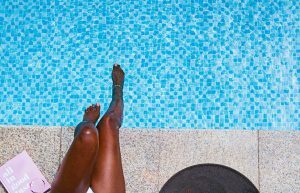 Pools that are constructed of plaster, like Diamond Brite, can last for 15 years or better if they’re maintained properly and regularly. It is important to have a skilled, professional do the work who specializes in the Diamond Brite area, whether it’s for repair or a first time pool plastering service. This is one feat that is not an advisable do-it-yourself project. Those who attempt usually end up paying for an expert to undo their mishap attempt and perform the plastering service. When remodeling your pool due to necessity or simply because you want an updated look or for the durability, Diamond Brite is the choice many pool owners turn to. It brings life back into your pool and adds years to it as well. It can be found in many textures and color options too. Updating your pool with Diamond Brite is wise and wonderful too. It will make your entire backyard shine. 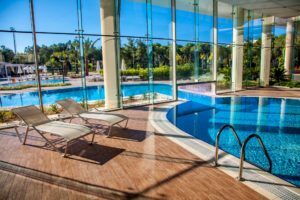 If you are considering one of these pool remodeling ideas, jump on in and give the professionals at Pool Deck Pros a call or visit them online. With years of experience under their belts, the highly-skilled, friendly team will have your pool area looking sparkling new in no time.